Meva formwork is being used to build the luxury apartments at Akoya by Damac. Meva says its MevaDec slab formwork has helped Trojan General Contracting win the tender on Akoya by Damac, a 42-million-sq-ft luxury golf community off Umm Suqeim Road in Dubai, UAE. The contractor will use MevaDec formwork to pour the slabs of the luxury apartments close to the city’s golf club. MevaDec was the winner thanks to its fast assembly and safety on the many smaller, but repetitive slab areas that are typical of this type of large-scale project being developed by Damac Properties. “In this case, early stripping of the slab formwork brings no benefit in terms of work flow. 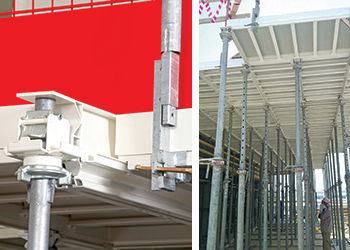 This is why MevaDec’s panel method with only two system components – panels and props with prop heads – proved the most suitable. This means reduced inventory and high-speed assembly by hand, without the need for any crane support,” says a spokesman for Meva. The system easily helps achieve worker safety. Fall protection at slab edges is set up in a fast, effective and labour-saving manner. Just a few simple steps ensure that a fall protection is in place all around and the slab formwork is safe for workers to move on it. A guard-railing post holder is attached to a MevaDec panel or to a beam, then a guard-railing post plugged into the holder and safety mesh slid into the guard-railing post, he says. Akoya by Damac is a $6-billion lifestyle community located in Al Hebya Two in Dubailand. It will be among the most luxurious developments in the region, with high-end branded real estate, luxury mansions and villas, serviced apartments, the Trump International Golf Course, a hotel, a 4.3-million-sq-ft private park and entertainment-themed retail walks. The first residents are set to make it their home shortly. The main contractors have all been making good progress on site with more than 2,600 villas and 18 apartment buildings at various stages of construction while the first substation – which will provide 75 per cent of the power to the development – has already been completed and handed over. The contract for the second substation has been awarded to Al Jazeera contracting and the work is expected to be completed in the second quarter of 2017. All villa packages have been awarded to Pivot, Commodore, Trojan, Delta, GNT and Alrakha and are in various stages of completion. The luxury golf community, which is almost 15 per cent larger than Central Park in New York City, US, is one of the largest master-developments under comprehensive construction in the UAE. The project was also named the ‘Best Golf Development in the World’ at the prestigious International Property Awards ceremony in London in December 2013. The first projects in Akoya will open later shortly, with the full community open and operational in 2019.